JetBlue is known for amazing flash sales and great in-flight service. While this sale doesn’t include $30 transcontinental flights, short and medium-haul routes are heavily discounted for fall and winter travel. Round-trip flights can be as low as $66, with one-way fares starting at just $33, available for departures on Monday through Thursday and Saturdays. Additionally, you can cash in some TrueBlue points for terrific value. Be sure to book before the sale ends on October 6 at 11:59pm ET. The sale is valid for travel beginning October 20 through January 31. 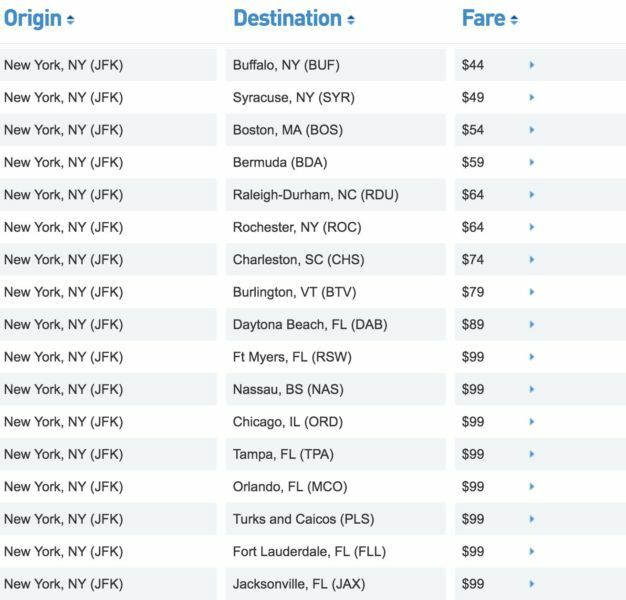 A great example of this is a one-way flight from New York (JFK) to Bermuda (BDA) — available for just $59. You can also redeem 2,300 points + $5.60 in taxes for this flight, while others, such as San Francisco (SFO) to Las Vegas (LAS) can be booked for just 1,500 points + $5.60 in taxes. When you subtract the taxes on the Bermuda award ticket,($53.30/2,300 points) = 2.31 cents per mile value; a great value for TrueBlue points which TPG values at between 1 and 1.4 cents each. Most other routes available with the sale can be purchased with points for around 2 cents per mile each, so make sure to check what the fare costs in points before booking. This is also a fantastic opportunity to take advantage of the $100 Visa Infinite flight discount available with the Ritz-Carlton Rewards Credit Card — in the case of San Francisco (SFO) to Las Vegas (LAS), you’ll pay just $32 for two round-trip tickets! Although the fares don’t seem to be appearing on the Visa Discount Air Benefit website, you should be able to call the number on the back of your Ritz card and book the tickets over the phone. San Francisco (SFO) to Las Vegas (LAS) for $33 one-way. San Francisco (SFO) to Las Vegas (LAS) for 1,500 points + $5.60 one-way. Washington D.C. (DCA) to Boston (BOS) for $48 one-way. New York (JFK) to Bermuda (BDA) for $59 one-way. New York (JFK) to Turks and Caicos (PLS) for $99 one-way. Don’t forget to use a credit card that earns additional points on airfare purchases, such as the Chase Sapphire Reserve, American Express® Gold Card or Citi Prestige (3x on airfare) or the Chase Sapphire Preferred Card (2x on all travel purchases). Check out this post for more on maximizing airfare purchases.